On Saturday, I spent my day volunteering with NYC Audubon and Together Green in the MillionTreesNYC Fall Volunteer Planting Day that occurred across the five boroughs in NYC. While I live in Queens and could have volunteered at Kissena Park, I decided to work with NYC Audubon, which took me out to Mount Lortetto, Staten Island where I joined many volunteers from a number of organizations to plant Tulip poplar, Sweetgum, Eastern white pine, White oak, Scarlet oak, Pin oak, Chestnut oak, Sassafras, and Eastern red cedar. The planting site that our group was given was hard on the back as the soil was compacted clay, which was rocky and made it very hard to break. There were some pre-dug holes, but they were small and so volunteers had to expand the diameter and depth of the holes in order to properly plant the trees. Nevertheless, volunteers toughed it out and even worked in the rain in completing our goal of planting 2000 trees at the site. Mount Loretto, is known as a place for birds, so I decided to do a bit of birding before the project began. I ended up seeing, Red-Throated Loons, Common Loons, Red-bellied Woodpecker, Cedar Waxwings, Merlin, Swamp Sparrow, Song Sparow, White-throated Sparrow, Goldfinch, Downy Woodpecker, Red-winged Blackbird and Blue-Jays. 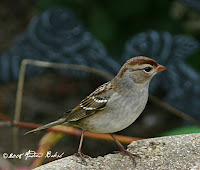 I plan to go back out there not only to bird, but to also check up on the plants to see how they are doing. One of the site where some of the 2000 trees were planted. Monk Parakeets, have been showing up quite frequently in the backyard. 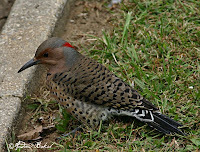 A few days ago, I heard a ruckus being made by a number of parakeets and saw them chasing a Cooper's Hawk. While I have seen Crows and Starlings mob hawks, this was the first time I saw Parakeets demonstrating the same behavior. Here are some photos of Monk Parakeets in the backyard. 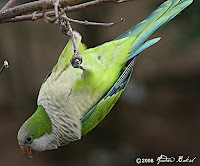 Monk Parakeet hanging upside down from the Elderberry Shrub. 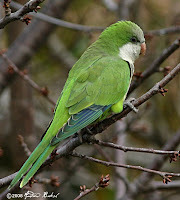 Monk Parakeet on a Cherry Tree. As September continues to wind down things have gotten noticeably quieter; the Orioles are no longer showing up in numbers and even the Goldfinches are in and out infrequently. 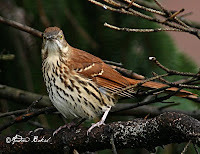 Yet with the departure comes the new fall/winter visitors and the Brown Thrasher, is one of them. I was lucky and delighted to be able to photograph this bird in the open as my experience in the past was always not good as they usually stay hidden in the undergrowth. Seems to be saying to me, "What are you looking at?" This morning, despite the prediction of heavy rain with winds I went on a bird walk at Fort Tilden and I am glad that I did because the rain held up until the walk was completed and I ended up learning a lot about the area. At the walk I met our guide Ranger Pat Newman and another birder by the name of Mike. This was my first visit to Fort Tilden and both Pat and Mike were very kind in sharing their knowledge of the area. Fort Tilden, which is part of Gateway National Recreation Area, is the last in a long line of fortifications that stood on the Rockaway peninsula ready to defend the United States from attack from the sea and air. Established in 1917, the site housed some of the most technologically advanced weaponry of the period including smooth-bore cannons, sixteen inch naval rifles, and Nike Ajax and Hercules air defense missiles. Its weaponry became obsolete in 1967 and ultimately the fort was transferred to the National Park Service. Fort Tilden's main armament, which was setup in 1924, were two 16-inch cannon known collectively as Battery Harris named after Henry Leavenworth Harris. Originally, these guns were placed out in the open and were able to turn a full 360 degrees to a range of 28 miles. This allowed them to reach as far as Long Island Sound, but their primary objective was to prevent attack from the east and south. In the image to the left is the concrete structure that was built to host the massive guns. This was built after world war II broke out in 1939 and vegetation was later added to the top of the structure to provide camouflage. Today, the top of the structure is used as an observatory for bird migration. 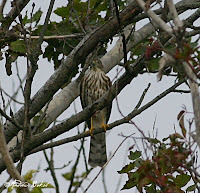 While our walk did not yield too many species...probably because of the weather, we were treated to a very neat display of juvenile Sharp Shinned Hawks being teased by Blue Jays and I was lucky enough to get a photo, albeit not a very good one of one of the accipiter. We ended with a list that had Northern Flickers, Catbirds, Eastern Towhees, Black Backed Gulls, Sharp Shinned Hakws, Northern Cardinals, Yellow Rumped Warblers, Downy Woodpeckers and a Great Blue Heron. As September comes to a close, the leaves are starting to fall and the air is noticeably cooler. My kind of weather I might add. 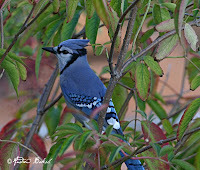 Additional fall visitors continue to show up, today I saw and photographed a Northern Flicker and we also have a number of Blue Jays hanging around, whose color I love because they make such good photograph subjects. 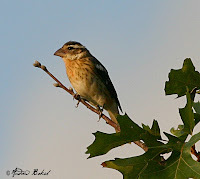 I also saw what looked like either a Blackpoll Warbler or a Black and White Warbler, but the look that I got was poor and I could not get a clean look with the BI's...the same with another bird which looked like a Blackheaded Grosbeak, but again the look was not good for a definitive ID. We are expecting rain tonight with the wind picking up into Saturday. I am hoping that with this weather front, a few visitors might stop over. On September the 20th, I volunteered with the American Littoral Society and New York City Audubon, in the Annual International Coastal Cleanup. This initiative spearheaded by the Littoral Society, is an effort to clean up our beaches and also to compile data on the thrash collected, in order to derive solutions to the problems…usually the source of the garbage. My first stop was Brighton Beach where I was supposed to do a media event on behalf of the NYC Audubon; however, I learned from Candace Khaokam, NYC Audubon representative and site captain, that the video folks were going to be late because they had to make a stop at Prospect Park and since no timetable was given for their arrival at Brighton Beach I decided that it was not worth waiting. Also, I had another commitment over at Plum Beach where I was expected to assist my friend Don Riepe in the cleanup effort at that site and so at around 10:00 A.M. I headed out to Plum Beach. Plum Beach, which is part of Gateway National Recreation Area, is located just past Sheepshead Bay. It is a beautiful but filthy (due to neglect) stretch of sand just off of the Belt Parkway, a major highway that runs through the boroughs of Queens and Brooklyn New York. The area, attracts people from all walks of life both the good and the bad. Visitors include, wind surfers, bikers, Hindu religious practitioners who perform rites in the water, sea shell collectors, sun bathers, birders and just casual visitors out for a stroll on the beach. Unfortunately, this location also attracts drug activities and individuals who use the desolate dunes to engage in lewd acts. In fact, the nefarious activities got to the point where the City Parks Department and National Park Service agreed to impose a curfew as of August 8th 2008, which made the parking lot and beach area off limits from 9:00 P.M. to 6:00 A.M. Yet despite some of the negativity, Plum Beach remain a location full of potential and it is in the Spring, when the Beach Plums are in bloom and the horse shoe crabs are around that one gets an appreciation of how important this site is in the ecological order. This and because it is important to keep our shorelines clean for our Shorbeirds, are the reasons why I return year after year to participate in the cleanup efforts. After all, as a bird watcher, I have a vested interest in creating an environment that is bird friendly, which in turn will encourage more visits from our feathered friends. On Saturday, the weather was great, though the volunteer turnout was lower than I expected. Nevertheless, some of my regular volunteers who participated with me over the past years when I was the beach cleanup captain did came out…thank you Lillian and Elda for your continued support. Our volunteers included Grad Students from City College, DEP (Sarah Ralph, and crew), American Littoral Society, New York City Audubon and other volunteers. As usual, teams were formed, some to do regular garbage retrieval and others who were assigned to collect plastic bottles. We cleaned up to around noon when the teams broke for lunch. After lunch, we headed up the bike path to a section that goes off into the dunes. At that location, we met DEP representative Sarah Ralph and her crew, and joined them in planting Beach and Spartina Grass. The teams worked quickly and very well with each other and soon we had all the grass plugs into the ground. We ended up completing the day’s activities around 3:30 P.M. The next cleanup for Plum Beach is Earth Day 2009, which is in the Spring; hopefully, we get a larger turnout. Here are some photos from the event. Graduate Students from City College helping out. Cleaning the litter at Plum Beach. 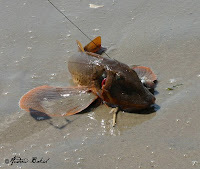 Yes, they do fish at Plum Beach; though the fisherman indicated this one would be thrown back into the water since it was not edible. Don found a moment to strike a pose in the midst of gathering the tools needed for planting. 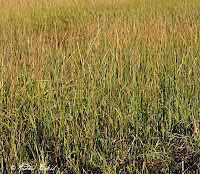 This is what the Spartina Grass should look like when it is fully grown. Volunteers pose with the collected garbage. Volunteers pose with Beach Grass plugs that were planted. Tomorrow is the Annual International Coastal Cleanup an initiative run by the American Littoral Society and I usually volunteer or lead one of the cleanup efforts. To learn more about this event, visit the American Littoral Society NE Chapter. My day gets off to an early start, with my first stop at the Brighton Beach Brooklyn location, to do some media work for the NYC Audubon Society who will be heading up the cleanup effort at that site. Later on, I will head over to the Plum Beach Location in Brooklyn NY to work with Don and many other volunteers in the cleanup and planting initiative. Check back later in the weekend for a full report and photos. On September 17th, I volunteered, with the DEP and the Jamaica Bay Guardian, to assist in the banding of Barn Owls in Queens NY. This was a follow-up to the August 19th banding where the adults (female) barn owls were banded. This time around, we went out to band the babies. The first box had everyone grinning because all five eggs had hatched. 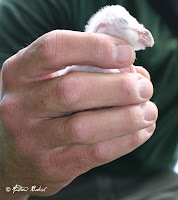 Chris our DEP banding expert examined the owlets and gave them all a clean bill of health. I was again thrilled to hold one of the owlets and suggested that Chris name him (assuming it was a boy) Soren, which is a name from the “GUARDIANS of GA’HOOLE series written by Kathryn Lasky. Our second box had even more good news as the result were two babies and four eggs to be hatched...one more egg than was recorded on August 19th. Chris did a quick examination as we needed to allow the female to reenter her nest box to continue the incubation process. In fact, Don was so concerned about hurrying up the process that on the way down the ladder, he missed the last rung and ended up in a blackberry shrub. He was none for the worst with just a few scratches…the group showed how much they cared by leaving him there until a few good photos were taken with him in the shrub:)…I have to get my hands on those photos. With that box we called it a day and headed back inland; along the way, we saw a number of birds including, Female Peregrine Falcon, several Ospreys, Great Egrets, Snowy Egret, Common Terns, Oystercatchers, A Great Blue Heron and lesser Yellow-Leg Sandpipers. Our next trip might be around the middle of October, so the babies have enough time to grow a bit before we band them. All in all, it was a good day for banding owlets and I can’t wait for our next trip. Don and Lloyd with Barn Owlets. This photo taken by Don Riepe shows all 5 Owlets. Barn Owlet from the second box...too small to be banded. September continues to impress; this morning, I sighted and photographed what turned out to be a Male Scarlet Tanager (thanks to the folks at birdforum.net in helping with the ID). 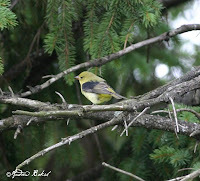 Also sighted but not photographed was a Red-Bellied Woodpecker and Northern Parula. Hopefully, I will have photos of these two soon. 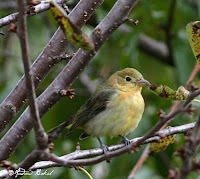 Getting back to the Scarlet Tanager, it is a first sighting in the backyard and this takes the list to 73 and counting. It was feeding on the Elderberries, so maybe I will see it again. Male Scarlet Tanager on Elderberry Shrub. Male Scarlet Tanager on pine tree. Well...after my walk at Jamaica Bay today, I was checking out the backyard to see if any new visitors had arrived and I spotted and photographed a Northern Water Thrush. 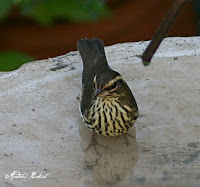 Northern Water Thrush at the birdbath. I visited Jamaica Bay Wildlife Refuge today and walked the North and South gardens as well as visited the South End of the East Pond. The pickings were not good at all and I ended up with a rather meager list of sightings. 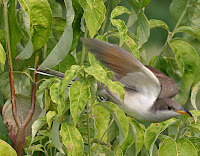 They included Great Crested Flycatcher, Red-eyed Vireos, American Redstarts, Catbirds, House Finch, Magnolia Warbler, Greater Yellow Legs, Lesser Yellow Legs, Mute Swan, Double Breasted Cormorant, Osprey, Black Crowned Night Heron, Semi Palmated Sandpipers, Blue Winged Teals, Green Winged Teals, Northern Shovelers, Great Blue Heron and Red winged blackbirds. I ran into a fellow birder today who indicated that an Eagle was sighted on the North End of the East Pond sometime last week. Now that is an unusual sighting at the Refuge, but not strange. I wish I had seen that majestic bird. Oh well, we have a storm watch for Tuesday and perhaps I may be lucky to see something special in the aftermath...we shall see. Here are a couple of photos from today's walk. 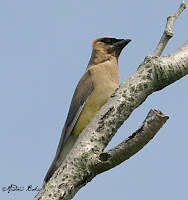 This Cedar Waxwing poses as a general or lord over his domain. I was lucky to get this photo that captures the contrast between a Greater Yellow and a Lesser Yellow Legs. September is picking up; new sightings included A Rose Breasted Grosbeak, which looks like a first Winter and A Great Crested Flycatcher. Still around are the Orioles, (though numbers have decreased), Carolina Wrens, American Goldfinches, Alder Flycatchers and the Veery. The other usual backyard visitors, like the Robins, Catbirds, Cardinals, Northern Mockingbirds, Sparrows, Mourning Doves are all popping in and out at their leisure. Here are some photos. Rose Breasted Grosbeak...looks like a first Winter. I had a couple visit a platform feeder a few years ago, but this is the first to visit in awhile. 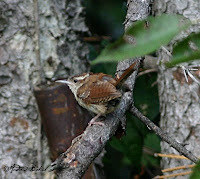 Carolina Wren...a very hard subject to photograph as it is a bird that is always on the move. 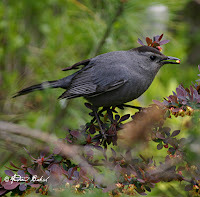 Gray Catbird on a Barberry Bush...looks like it is eating the blossoms. 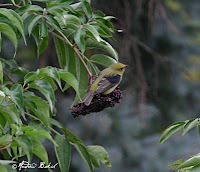 This one appears to be a Yellow-bellied...though I think I will try and confirm the ID with the good folks at Birdforum. 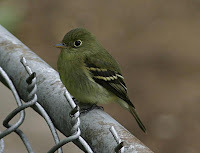 Possibly a Yellow-bellied Flycatcher in the backyard. 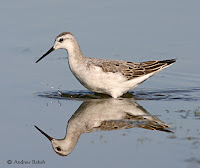 It has been a busy couple of days and coupled with the weather we had over the weekend, I did not get much birding done. However, this morning I did see new arrivals in terms of Fall visitors in the backyard. 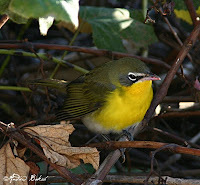 A male and possible female common Yellow-Throat were spotted around the Pyracanthas an evergreen plant commonly know as Firethorn. 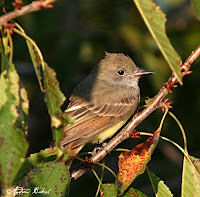 Also seen and photographed was a "Least Flycatcher." I am hoping to be able to listen and record the call of this flycatcher, which will help me to improve my "Birding by Ear" skills. 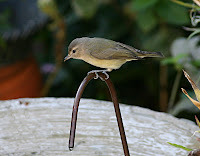 Least Flycatcher in the backyard. 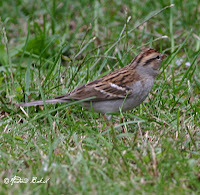 Thanks to the folks at Birdforum.net in assisting with the ID. 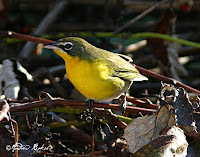 September is here and the first new visitors happen to be a Male American Redstart and a Red-eyed Vireo. 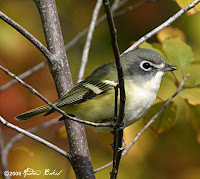 The Red-eyed Vireo, is a first time visitor, so the new month is off to a great start. 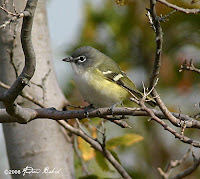 Here is a photograph I took of the Red-eyed Vireo among the Viburnums. Red-eyed Vireo among the Viburnums.